Ron Spencer, Warrington Road Club 100 Mile record Holder, National 12 Hour Champion. 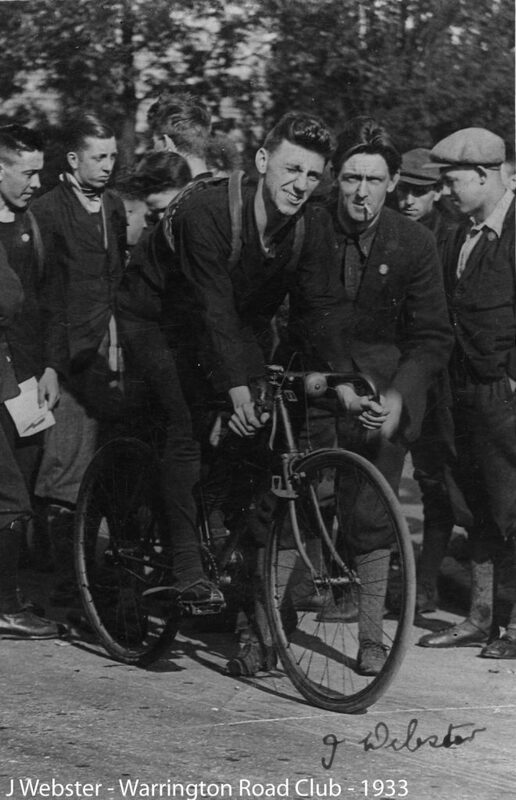 This section of the web site is dedicated to the history of Warrington Road Club’s own records and achievements of riders throughout the history of the club.Below is a historical journal with photographs and details about our club riders’ most sought after, or inspirational, achievements for cycling at club level and more. For historical record, you can also review all our Club Records going back to 1926 and all our Club Trophy Winners since 1927 in each respective page in the Club Records menu section. 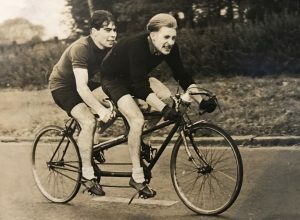 Two of the top riders in the early days were Jim Sutton and Jack Webster, who between them held numerous records from 25 Miles right through to 12 Hours, from 1927 through to the last being broken in 1950. 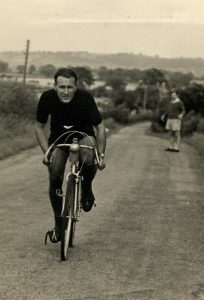 Jim Sutton held club records in the 25, 30, 100 and 24 Hour Time Trial disciplines and broke his own and other competing club riders’ records 8 times over an 8 year period within the club. 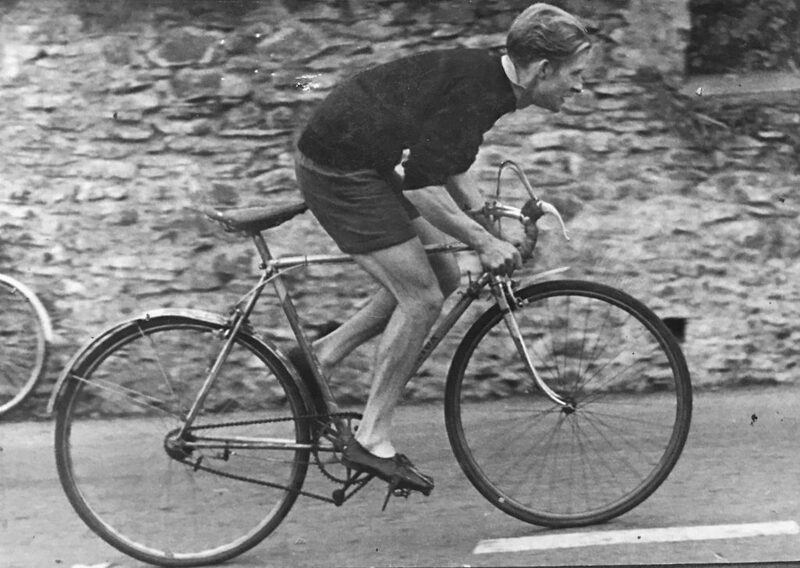 This really stylish picture of Jim Sutton from 1927 really captures the type of kit worn and bikes ridden at that time. He is pictured with The Dingsdale Perpetual Trophy (our oldest Trophy) that he won 6 times in the early period of the club. 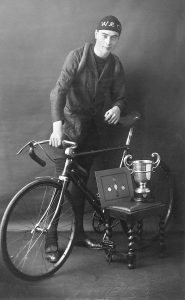 Jim Sutton 1927 with his club medals and the first winner of the Dingsdale Perpetual Trophy. That time in the 12 Hour would be good enough for 35th place in the 2017 National 12 Hour, leaving 16 other riders behind him. I know you can’t make direct comparisons, but surely this has to be very impressive given the kit he’s riding in and the bike he’s riding on. In 1938 just as the reign of Webster and Sutton was coming to an end a new young star appeared on the scene. Fifteen year old Alan Barker, son of the club mentor, promptly won the club hill climb and the following year won three club 25s picking up two first handicaps and one second handicap. 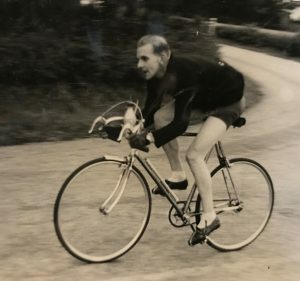 By the time he was called up into the RAF in 1943 he had broken the club 25 and 50 mile records three times each and also broke the 30 mile record. 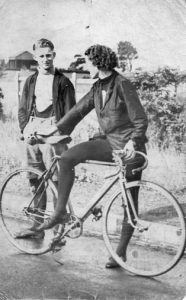 Alan Barker with wife Dorothy Barker (and former Club Race Secretary) before a race. Dorothy donning old school tights and alpaca race jacket. He won a number of open events and was a brilliant hillclimber. His photograph appeared in the magazine ‘Cycling’ in the early 1940s with the caption that he was the fastest 40 cigarettes a day rider in the country. Alan broke club records 6 times at distances of 25, 30, 50 and 12 Hours. Not far behind his father Harry Barker in service to the club, Alan was Club President for over fifty years and organised the Harry Barker Memorial 50 TT for over forty years. He has also served as race secretary, magazine and press secretary, timekeeper and handicapper. A true legend in our club, the photo pictured is of Alan passing the Britannia Inn on the Horse Shoe Pass Hill Climb. Warrington Road Clubs Alan Barker racing up the Horseshoe Pass shortly after his RAF National Service. Inez Finch started racing in 1943 (when she was still Inez Povey) and she raced every year since. Her record is remarkable. 55 years of racing that have included over 100 wins in open and association events, a couple of wins in road races, six times in the top six of the Women’s B.B.A.R. including two third placings, Manchester Ladies B.A.R. champion fourteen times, and victory in the Women’s National 100mile Championship in 1977. 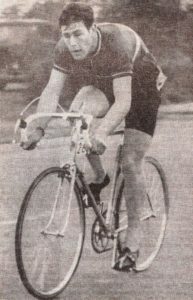 Inez Finch, National 100 Mile Time Trial Champion 1977. She broke age-related records at 10 or 25 miles, or both, every year since age-related records were introduced for women veterans. As for Club Records, the Time Trial disciplines of 10, 25, 50 and 100 Miles are still held by Inez as at 2017. In 1961 we had five lady members racing, one of them Terry Riley, became the club’s second most successful lady rider, winning a number of open events and Anne Barker, daughter of Alan and Dorothy became the first ever Manchester District Junior Ladies Champion, also in 1961. In 1953 Arthur Turner finished third in the National Championship, gaining the club’s first National Championship medal. In the same year he held the clubs 50 and 100 miles and 12 hour and 24 hour records, plus the club 100 mile tandem record. In 1954 he went one better and gained a National Championship Silver Medal with a new club record distance of 457 miles, but in 1955 he was in contention for a gold medal when he was knocked off by a drunk. Stan Lea was another fantastic Warrington Rider in that era. His greatest triumph came twenty years after his first 24 hour venture when he won the 1970 Mersey Roads 24 with a distance of 441.9 miles ten miles less than his greatest distance two years earlier. He must be the club’s greatest ever mileage eater. He rode thirteen 24 hour events and thirty consecutive Anfield 100s. His best performance was in 1953 when he was fourth fastest with a club record time of 4.30.23, won the first handicap prize and led the winning team. Stan won 13 club trophies spanning from 1949 to 1978 and also rode many prodigious non-racing miles. Another star rider appeared on the scene in 1944. Harry Jackson started his racing career by winning all the club events in 1944 and 1945 and was club champion in 1945, 1946 and 1947 when he won his first open event. He became one of the leading riders in the northwest. Harry Jackson, Club Record Holder. 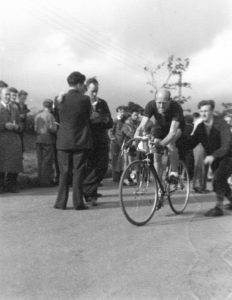 In 1948 he won a club 25 on Fearnhead in exactly one hour at a time when only fourteen riders in the whole country had beaten the hour, and in the same year he also broke the club 50 and 100 mile records. 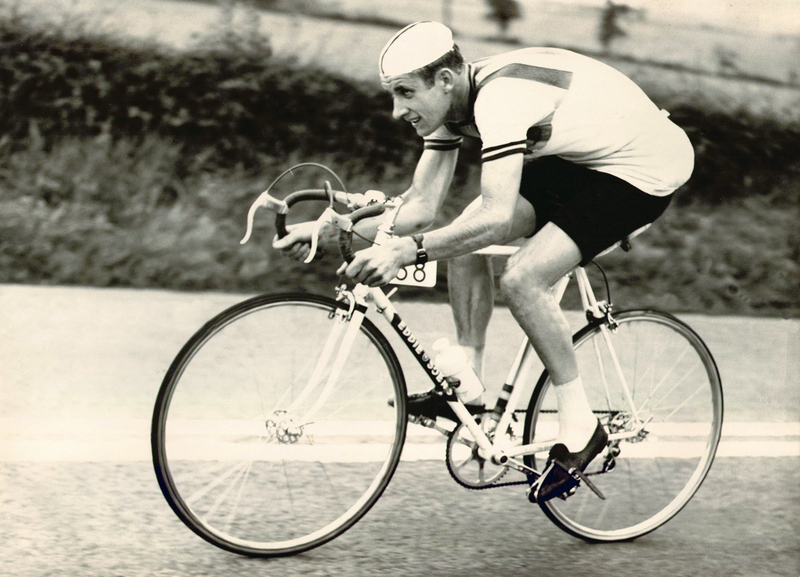 The hour wasn’t beaten on Fearnhead until 1959 when Dave Keen did 59.06. Another new member a few years later was Reg Devonport, a youngster from Widnes. In 1950 he broke the club 50 and 100 mile records, the former also beating the Merseyside area record that had stood for fourteen years He also won the Merseyside Mountain Trial in record time. Other open wins followed but a promising career was cut short when he emigrated to the USA, where incidentally he broke the National coast-to-coast record. Dave Keen was a 15 year old from Crewe when he joined the club. In his first season he won the Wagstaffe Award for the fastest novice in the Manchester area. 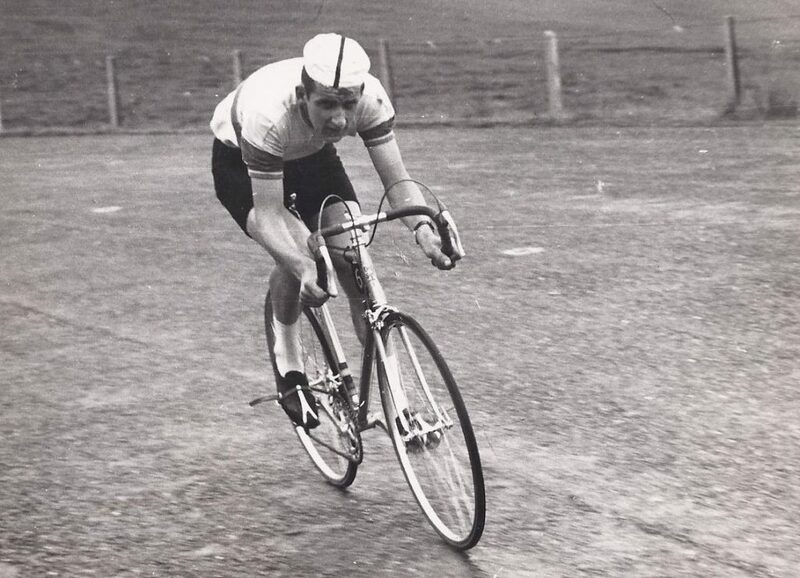 Dave Keen, Warrington Road Club racing a 50TT in 1961. He beat the hour for the first time as a 16 year old, a feat he was to repeat over eighty times. 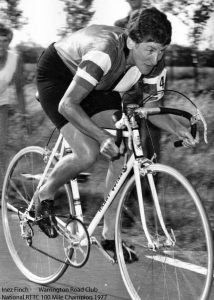 In 1959 when he was 18 years old he became the first club member to beat two hours for 50 miles and a fortnight later became the first club member to win the Harry Barker 50 with a time of 2.0.11. In 21st place was 16 year old Ron Spencer with a time of 2.17.13 who was on his way to emulating Dave Keen’s feat of winning the Wagstaffe Trophy. The 1950s finished in a blaze of glory when, in 1959 the club gained National Championship Gold Medals for the first time. 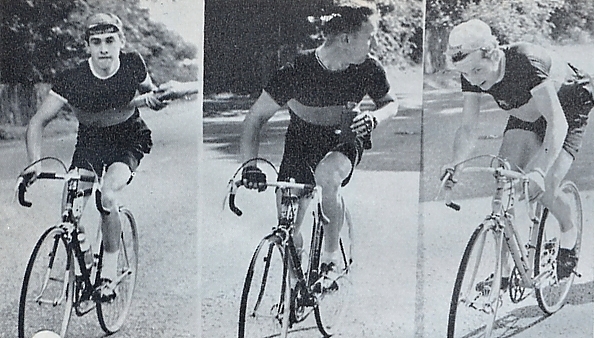 John Atkinson (5th), Brian Yuile (9th) and John Haddock (22nd) won the team award in the National 12 hour championship with a distance of 747.7 miles beating a very strong Manchester Victoria Wheelers team to the title that year. 19 year old John Atkinson had previously won the MDTTA 12 hour event and only a series of misfortunes robbed him of an individual National Championship medal due to punctures and mechanical problems(he had to change his bikes six times). Pictured are the photographs of the three riders taken on the day of the event and featured in the National Cycling Magazine at the end of that year. Pictured left to right as you look at the picture, John Haddock 243.375 Miles, Brian Yuile 250.75 Miles and John Atkinson 253.5 Miles, wearing the Maroon and Gold kit of the time. Whilst success still came in the 1960s with Dave Keen, Alan Kefford and Alan Barber all won open events and Alan Barber was selected for an international track squad. At an early age, it was clear that Ron Spencer was a special talent, winning many events on his way to his greatest achievement when he won the 1963 National 12 hour Championship with 267.3 miles. In the same year he was second in the B.B.A.R., narrowly beaten by Peter Hill, plus he won the Manchester Area B.A.R. with a record speed. Ron also broke the club’s 50 miles, 100 miles and 12 hour records. He was also selected for the Merseyside squad in 2 day and 4 day stage races. The following year was picked for the Great Britain squad in the 8 day Tour of Holland and to show his versatility won the Merseyside Cyclo Cross Championship. His 12 Hour Record still stands to this day (2017). Ron won over 50 Warrington Road Club Trophies spanning from 1958 to 1995, a record we doubt will ever be beaten, he was Club Secretary, Chairman and President, Race Organiser as well as a Coach and friend to many.